The monthly meeting of the Long Island Herpetological Society, for May 2013, will take place on Sunday, May 5th, at SUNY Farmingdale as usual; however PLEASE NOTE THE TIME FOR THE MEETING COMMENCEMENT HAS BEEN MOVED UP FROM THE NORMAL 1PM START TIME TO 12 NOON. Please make sure to dress appropriately as this will be a field day on SUNY Farmingdale grounds. Bring a camera, and a hat and/or sunscreen, appropriate shoes for a short hike, and maybe rain gear as needed. The meeting will run from about noon until 3PM. You never quite know what you are going to find when you flip over a board looking for herps in Texas. Strange bedfellows, click to enlarge. ... if you kept it outside and have not seen it in a long time. It may turn up yet! See: http://www.dailymail.co.uk/news/article-2308165/Sydney-missing-tortoise-10-months-burrowed-mud-Cambridgeshire-garden.html. Thanks to Deb H for the submission. The home of a reptile supplier, in Colorado, burned to the ground recently leaving a slithery surprise for the responding firemen. See: http://denver.cbslocal.com/2013/04/18/home-goes-up-in-flames-in-adams-county/. Thanks to Deb H for the link and heads up on this one. Did the solution work? Sure it did, at the cost of the wasted lives of thousands of koi and probably of other animals too. I think the plan was somewhat extreme and could have been better effected had it been approached from a bit of a different viewpoint so that not all of the koi needed to be killed, their lives wasted. Think about it for a few minutes. Really give it some thought, and see if you can come up with a potentially better solution that would have benefited the salamanders, removed the koi from the pond without killing many of them, and benefited the tax payer a good deal too while also supplying the pet trade with fish. Have you got it? They could have had wildlife authorities lay in wait for those who were harvesting the koi. Then given them a plea deal that in essence would have them harvest as many as they could within the scope of a month, under government supervision. Of course, if they did not return to the pond, or agree to the deal, then volunteers could have been sought to catch the fish. After they had been caught, the fish could have been sold into the trade to pond keepers (koi bring good money). 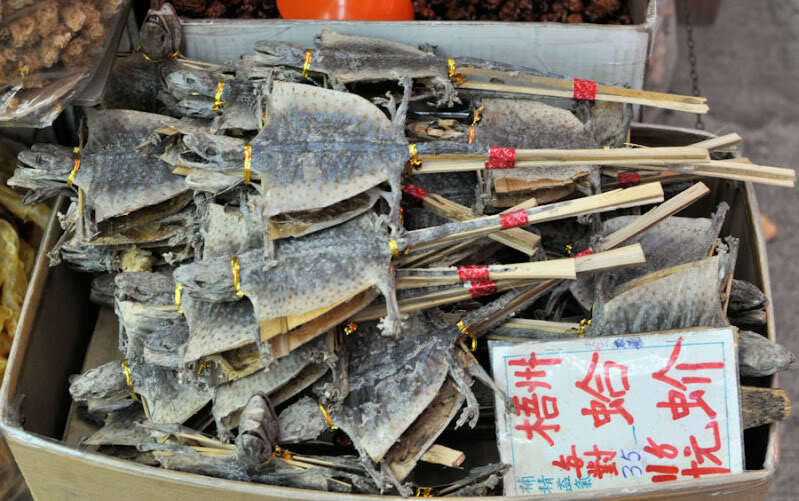 Any naturally occurring fish, crustaceans or amphibians caught in the nets could have been saved. Then and only then, the pond could have been poisoned, killing any remaining koi, so that the pond would again become a haven for the Jefferson's Salamanders. Not all that complicated and no need to kill all of the fish. Well, that's what I think anyway (my thoughts do not necessarily represent the outlook of the LIHS on this matter). Once again, hat tip and my thanks to Deb H for sending me yet another article for use on the LIHS Blogger. What Is Your Kid Packing On The Way To School? A backpack, found at a school bus stop in New Braunfels, Texas, was found to contain somewhat of a surprise by a parent who opened the bag. The contents: a 42" long Western Diamondback rattler! 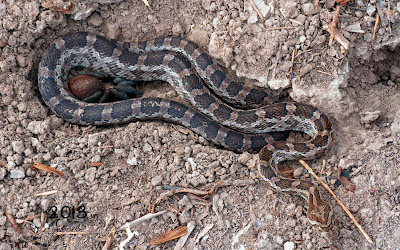 Luckily, it was a cold morning, so the snake was probably fairly inactive and thankfully no one was bitten by it. Of course, the local police have their suspicions about how the snake got into the backpack and how the pack containing the snake wound up at the school bus stop. 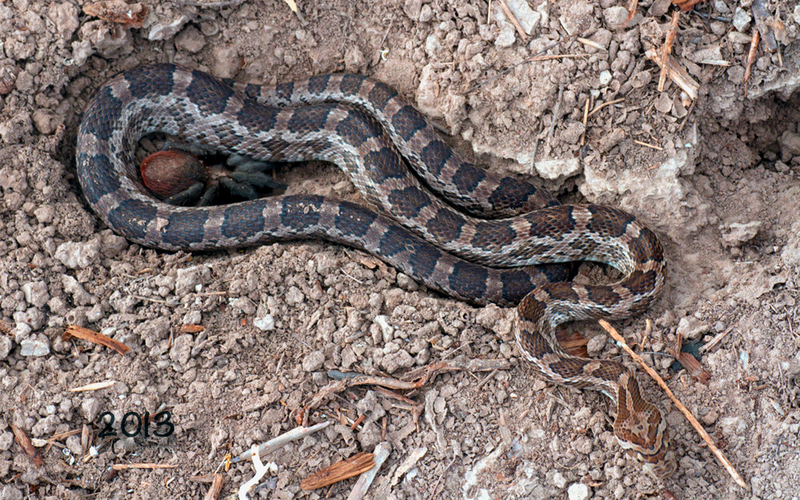 Their suspicions were aroused because they believe it unlikely that the snake just crawled into a bag, at a bus stop, especially since the bag was closed and it was a very cool day (when rattlers are usually inactive) and since the bag did not contain any school related materials. Sounds like truly malicious intent to me and again thank goodness no one was injured. The snake fared well to. It was brought to a reptile farm and it will be released upon conclusion of the investigation. If you are at all familiar with lizards ten you probably have seen or at least heard of Tokay Geckos. They have been popular animals within the pet trade for decades. Why they are so popular is certainly not due to their demeanor, they do not tame easily (but yes they can be tamed) and have a proclivity for biting the hand that feeds them or biting anything else that gets too close to their mouths. So, that leaves us with some other possibilities for their popularity as pets. One of the foremost has probably been that they are certainly an eye catching lizard. They are quite colorful and beautiful little animals. Certainly, their beauty has caught the eye of more than just one person at a reptile show or in a pet shop and those folks just bought them on impulse. Those folks often wind up getting a couple of surprises after they buy those cute little lizards. The first being their aggressive biting behavior and the second being the size to which they grow - adults often grow to over 12" long. 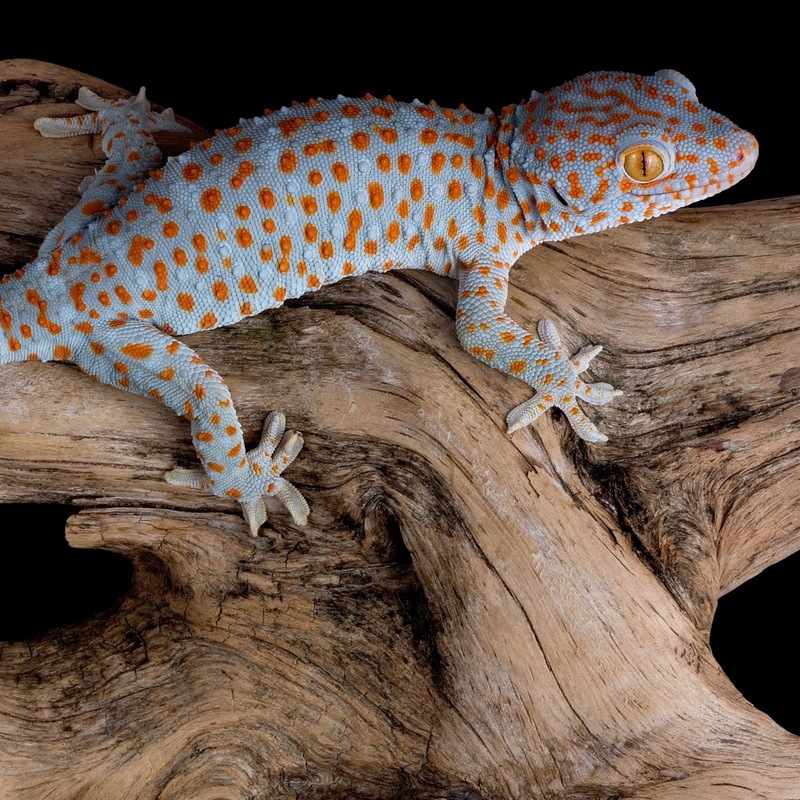 Tokay Geckos are one of the largest gecko species. Those two surprises often result in pet Tokay Geckos being offered for adoption or otherwise gotten rid of by a disenchanted owner. Yet, they remain popular in the pet trade so, what other reason(s) could there be for their popularity? Maybe another reason could be their ravenous appetites for insects. I remember, years ago, back when I was in my young twenties, there was a pet shop, on Bleecker Street in Greenwich Village, that rented out Tokay Geckos. Yes, you read that right, they rented them out to people for short term use. The idea was that people who had roach infested apartments would rent the geckos, turn them loose in their apartments, let them wipe out the roaches by eating them and then the renter would return the gecko to the pet shop. Since I first saw this in the winter months, I asked the shop owner about how the geckos survived an apartment in the winter months, when even indoor temps were not ideal. The shop owner told me the Tokay Geckos usually found their way to the kitchen where most roaches thrived and where there was a constant source of heat so the geckos could thermoregulate. What was the heat source? Nope, not the stove. It was the refrigerator which would have a warm area around its motor while running. That is where the shop owner told folks to look for the geckos if they wanted to find and catch them to return them to the shop after the roaches were controlled or eliminated. While he went on to explain to me that he never really expected anyone to bring back any of the geckos, at least one person had done so and that person swore his (or was it her) apartment was then roach free. 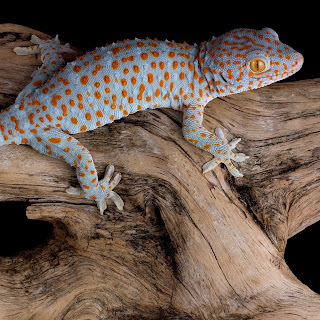 As for their supposed roach eliminating abilities, even though they have great appetites, and certainly will eat roaches, I don't think a Tokay Gecko or two would be enough to clear an apartment of roaches but who knows. Yet, I find that little incentive to make them high demand pets since there are many other ways to eliminate those six legged vermin. So what other reason(s) are left to us for their popularity. Did you see the additional reason in the above paragraph, other than them being roach eaters, for their popularity? They are fairly hearty and are pretty easy to keep; although, I do not recommend depending on the heat from a refrigerator motor to suffice. Keeping them in a proper enclosure under proper conditions is essential. They need to get the right amount and variety of food and the correct amount of water and heat to thrive. Care sheets are available online and there have been several books published about their care. Dried Tokay Geckos for sale for medicinal purposes. If the report is correct, the Tokay Gecko may be facing drastically declining numbers in the wild. Luckily, as the report points out in a small snippet, Tokay Geckos are commonly captive bred in the UK and USA. Still though, if wild populations are extirpated, wild caught Tokay Geckos will be much harder to come by in the pet trade because legislation will likely have been enacted to prevent them being taken from the wild. Thus, the cost of wild caught Tokay Geckos is almost sure to rise and that will undoubtedly impact the price of captive bred and born specimens which will also increase. Once, if ever, they are considered endangered the demand for them, among reptile fanciers, may also increase and that would also cause the price to rise. A few countries already have Lawson the books trying to protect native populations. So, if you have ever wanted a Tokay Gecko, now may be the time to acquire one - and maybe even to start a captive breeding project. You certainly would be helping them in nature if you were to breed them in captivity, if only because you would be lessening the demand for wild caught animals in the pet trade. You also could be doing yourself a favor by getting the jump on others who will be sure to turn to captive breeding of Tokay Geckos if and when they become an endangered or threatened species. Anyway you look at them though, they are an attractive and interesting lizard. The time is right for you to get one or three - it is not too late yet - so what are you waiting for - afraid of a little bite now and then, are you? I sure am! A new species of frog has been discovered. 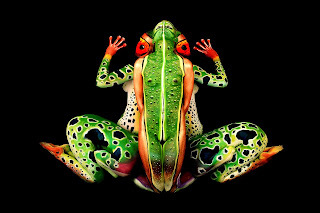 It is an extremely colorful, yet very strange, variety known as the Five Peep Frog. If you look closely you will see, not hear, how it earned its name. Count 'em folks, there are five people I the picture. Hat tip to Deb H for submission of the photo. The Long Island Herpetological Society (LIHS) will hold its regular monthly meeting, this weekend, on Sunday April 14th. 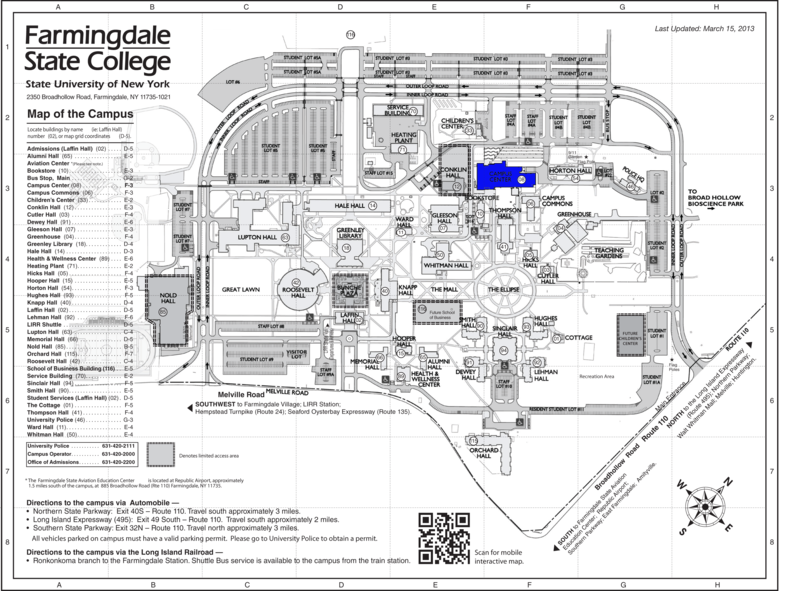 The meeting is scheduled to begin at 1PM and end at 4PM (usually ends earlier) and will be held in the Conference Center at SUNY Farmingdale in Melville, NY (directions and campus map). As usual, the meeting is open to the public and there is not an admission charge. The speaker for the meeting has not yet been announced. The annual Long Island Herpetological Society dinner will be held on Saturday, April 27, 2013, from 6:545 to 10PM. The location is new, so if you plan to attend please make note of it. 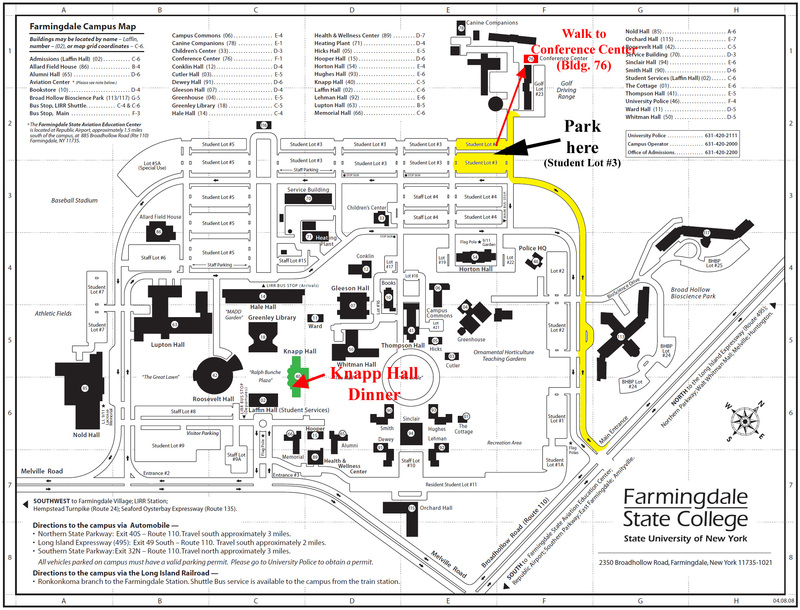 It will be held at the Campus Center (Building #8) [click for map] SUNY-Farmingdale State University. The cost for adults will be $25.oo and it will be $10.00 for kids under 12 years old. Tickets are available on a first come, first served, basis and are obtainable though: Rich Meyer at: Gojiira@Optonline.net. Tickets must be paid for by April 21st. Open to LIHS members and their guests. I have always liked the look of the San Francisco Garter Snake. 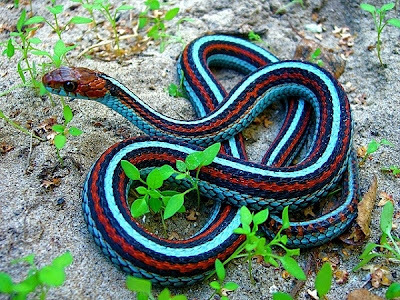 It is one of, if not, the prettiest of all of the Garter Snakes. They are almost impossible, as far as I am aware, to acquire as they are heavily protected. This picture, sent in by Deb Hoppe (who else), shows a really nice. Yes the photo is enhanced, probably to increase the color saturation but it is nice anyway. 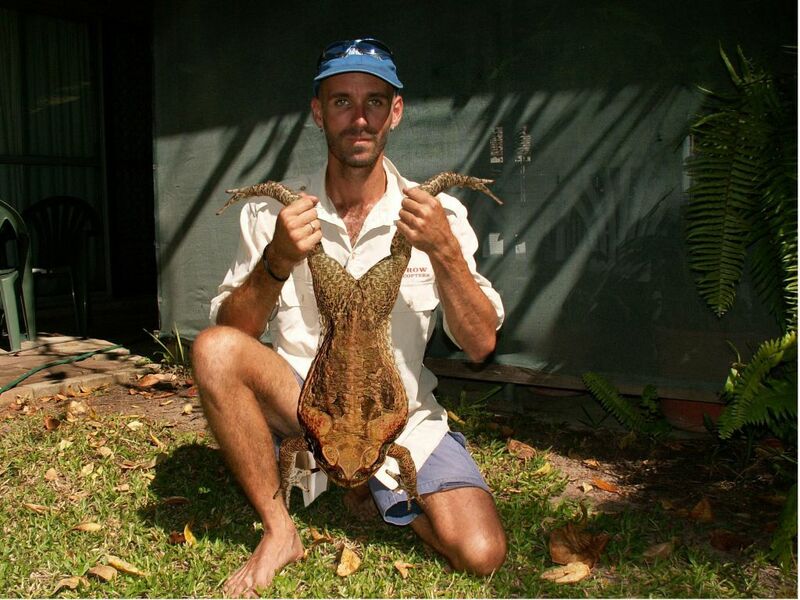 A hat tip and my thanks to Deb H.
Deb Hoppe sent in this extraordinary pic of a Cane Toad from Down-under (Australia). Wow, it is huge. 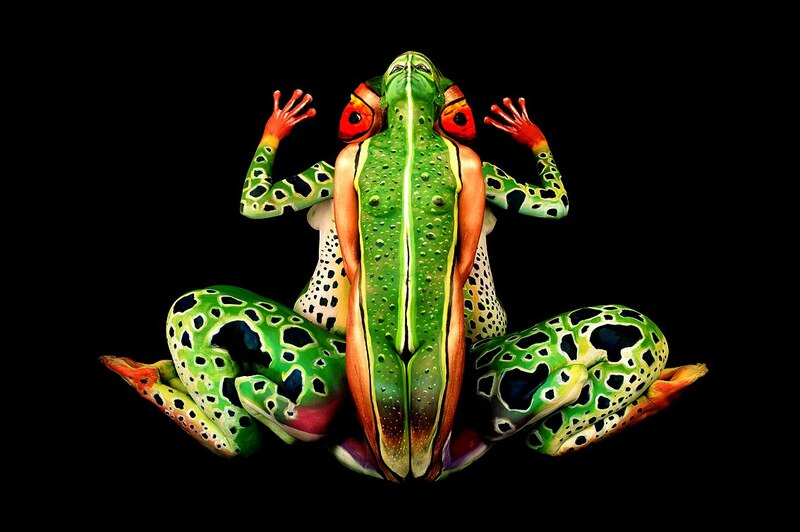 I don't know about you but I keep looking at it and imagining it as a bull frog and thinking about only needing two legs for each person's appetizer. Just in case you did not know, Cane Toads are not native to Australia and are an extremely invasive species, thanks to being introduced into Australia by man, that has caused havoc among the wildlife population in that country. While some people in Australia keep them as pets, the official line is they are pests, they are often killed on sight. Once again, my thanks to Deb H.